While you may have heard some buzz about the Capital Ale House Oktoberfest festival you will want to read some of the facts that make it one of the most loved events in the greatest city in the nation! Read below for the top 8 reasons you don’t want to miss out on the fun and excitement at this great September 21, 2013 event! We will celebrate Oktoberfest with German food specials, German beers and exciting events throughout our Fest. We’ll present live German beer-drinking and dancing music to compliment the great traditional Bavarian foods and beers. There will be a Kinderplatz area. This is a family friendly event. 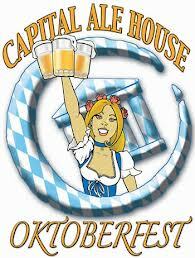 The Richmond VA Capital Ale House Oktoberfest festival is a 1 day festival held on September 21.